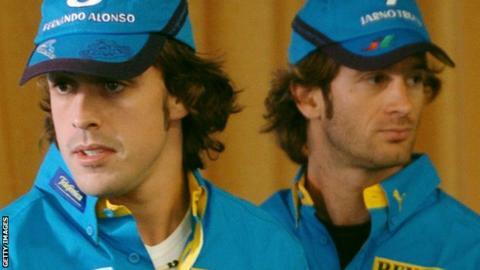 Double world champion Fernando Alonso might not win another race in his career, says ex team-mate Jarno Trulli. The 33-year-old's return to McLaren this season has been blighted by issues including the car's poor performance. He heads into his home Formula 1 race in Barcelona on Sunday without a point. "I wonder if he might win another race or championship," said Trulli. "McLaren won't get on top of the problems quickly and won't easily catch up with the teams in front next year." Alonso, who was in the same Renault team as Trulli in 2003 and 2004, left Ferrari after five years at the end of last season, having achieved excellent results with a car that many believed was not good enough to deliver him the title. He re-joined McLaren on a three-year deal having first driven for them for one season in 2007, with four-time champion Sebastian Vettel taking his seat at the Scuderia. But while both Ferrari and the German driver have started 2015 well - winning in Malaysia - Alonso has struggled in a far less competitive car. The Spaniard missed the first race in Australia because he was recovering from injuries suffered during a pre-season testing crash, before retiring in his first outing in Malaysia. He then finished 12th and 11th in the next two races - and his McLaren team-mate, Jenson Button, has not fared any better. "I had a very good relationship with Fernando at Renault. Firstly, you are dealing with a good driver - he knows he can win and wants to win - and secondly, he's the kind of character that wants to be in charge. That might be good for the team because you need a driver with a personality. "But sometimes Fernando is tough to deal with. This is the tough time and tough side of the deal. Both driver and team should find a compromise and improve the team situation. "Fernando is a good team player, but both parties need to work together properly or else he might prove to be a problem." Alonso says the team will make a "huge step forward" at Barcelona, with developments to both car and engine. Trulli added: "The teams in front, they are not sleeping or waiting - they will carry on working and developing. "It might be different if there is a big regulation change or like Ferrari did. They turned their situation around in a great way, I never would have imagined that. "Anything can happen, but I am concerned. Fernando's situation is not ideal to win. I hope I am wrong. "McLaren is a good team but they are fighting with Ferrari and Mercedes, who are manufacturers, and that makes a big difference."